There were a lot of reasons why musician Leyla McCalla was called to New Orleans. Music was everywhere — multiple styles played by a staggering number of talented musicians. There was the lifestyle, far more affordable and less hectic than her previous home in New York, where she was constantly bartending or teaching cello to make ends meet. But the most unexpected confirmation of her need to move there came from a cemetery. Walking through one of them during a visit, she was struck by the sudden appearance of family names, jumping off the tombs in a city far from her New Jersey birthplace. A city far from Haiti, where her family came from. Dupuy. Lemoine. Wooley. None of them ancient history, but familiar names attached to people she loved and grew up with. “I saw all of those names and it kind of surprised me because I’d never thought of those names as being particularly Haitian or particularly Creole,” says McCalla. It was a clashing of history that she still grapples with — a history shot through with the twin stories of Haiti and New Orleans, forever joined at the hip, from their early colonial beginnings to parallel slave revolts, a common Creole language, and music that filled the streets in forms the rest of the world continues to mimic. Coming to New Orleans had the feeling of destiny for McCalla, the obvious next step in a journey she’d been on since she was first accidentally assigned to play the cello in school. She grew up with classical music, then began to consider what else was possible after seeing a Haitian folk band featuring a cellist named Rufus Cappadocia (who became one of her mentors). Since arriving in New Orleans, McCalla has become one of the most distinct voices in a city brimming with top-flight musicians. 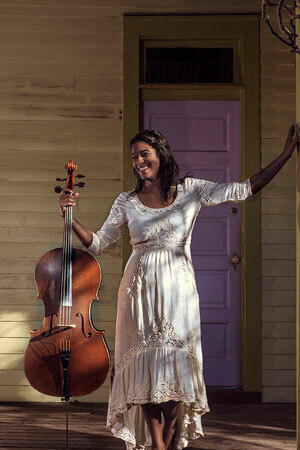 Her work has the clarity of a church bell and the precision of a razor, something she honed through years of playing on the streets of New Orleans (often classical work — “I felt, here’s something I can do that nobody else is doing”) and working with several bands (including the Grammy-winning Carolina Chocolate Drops). Her debut album, Vari-Colored Songs, a musical tribute to the work of Langston Hughes, received widespread acclaim, as much for McCalla’s musicianship and voice as for her recreations of many of Hughes’ classic poems, some of which are performed in Haitian Creole (McCalla’s father aided with the translations). It was a deeply personal project, as McCalla credits Hughes as the person who most made her want to be an artist. But while the sense of history and displacement might be more obvious on the album, one of the more subtle themes is that of family. Many musicians who McCalla played with over the years in New Orleans (from Aurora Nealand to Shaye Cohn to Louis Michaud) contribute to the album, and her sister Sabine performs backup vocals on “Vietnam.” The beautiful Haitian folk song “Fey-O” is a song that McCalla’s mother used to sing to her, and which she now sings to her own daughter. That sense of family, McCalla says, has made her want to dive even further into her own history. That continuing drive to look at big themes will be at the heart of McCalla’s third album, The Capitalist Blues (due out in February). Produced by local musician Jimmy Horn (profiled in Waxwing Issue IX), and featuring a wide range of New Orleans musicians, the album will contain songs that look deeper at life in capitalist society, with the overtones of the current political climate close to the surface. And yet, for all the serious subject matter, McCalla insists the album is still about a celebration of life that makes creation and connection possible. The title track was recorded in New Orleans’ celebrated Preservation Hall, and features such local heavy hitters as the Palmetto Bug Stompers, Carl LeBlanc, and Shannon Powell. And if there’s a through line you can draw between McCalla’s inspirations and herself, it would be in that creation of joy in the face of overwhelming odds. You can sense her kinship with her fellow artists — from Langston Hughes to the troubadours of Haiti to the musicians of New Orleans she plays with today — who fought so hard to keep their stories from being swallowed up by the tidal wave of history. In her work, there is a clear sense of that history, but also a deep optimism that the story is continuous — that the river she floats her songs on will carry them farther than she can take them herself.